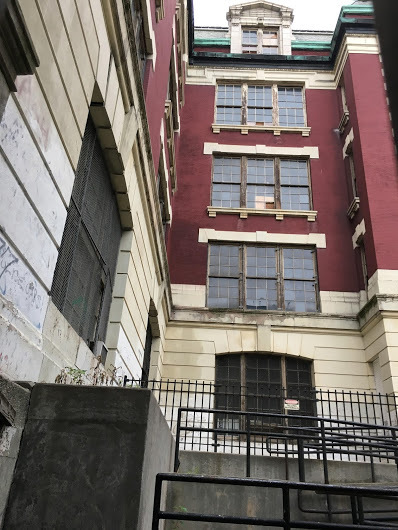 On Sunday, the Daily News reported that some of the 30 participants who showed up at a City Hall rally to support turning the former P.S 64 and CHARAS/El Bohio community center into a dorm were paid extras. The organizers — a group called East Village Cares — strongly denied that the extras received money ($50) for their time. In a follow-up piece at the News yesterday, property owner Gregg Singer also denied that any of the supporters were paid to attend the rally on Nov. 17. Singer also blamed those opposing his dorm project. [A] judge ordered Singer to pay a settlement of more than $8 million to his investors, who have sued him for failing to develop the building while continuing to pay himself management fees of up to $30,000 a month. Singer bought the property on Ninth Street between Avenue B and Avenue C from the city in 1998. He wants to turn the landmarked building into a dorm, and continues in a holding pattern while the DOB maintains a Stop Work Order on the building. As previously reported, there's deed restriction on the property, which can only be developed for "community facility use." Crain's also has an article, published Wednesday, on Singer and the ongoing issues with the address. Depending on whom you believe, owner Gregg Singer is either the victim of a decadeslong political conspiracy or he has squandered tens of millions of dollars and years of his life pursuing schemes to circumvent the deed restrictions and convert the building into a massive youth hostel. ...P.S. 64 seems destined to remain a fossil from the old neighborhood, a shell petrified for posterity, of no use to the community or anybody else. The fake signs from the protest (including the paid protesters who look like they were shipped in from that church up in Harlem that regularly rents out their members for UN protests) should have read “Who is East Village Cares?” I haven’t seen so much astroturfing in years. Someone might want to tell them not to put a photo of a pair of townhouses in the West Village (Is that Charles Street???) on a website that’s supposed to be about the East Village. There are also a few handy if dated news items on eastvillagecares.org, including blog item about the Big Belly™ trash cans, with the picture of the trash can mysteriously rotated 90 degress on its side, plus links to articles on the now dead DNA Info, and to the EV Grieve coverage infamous TSP sinkhole, so they are obviously reading this website. They might want to take down those screenshots of the petitions, a lot of the signatures look suspiciously identitcal, not to mention illegible. Now that this fakery has been exposed, it’s time for DeBlasio to fulfill his campaign promise and take back this property. Any time I hear the term "fake news", especially when it comes out of the mouths of thugs like Donald Dump or Gregg Singer, then I know right away that whatever they are railing against is real. How dare the jewelry designer to the stars comment on our beloved La plaza Cultural. Move to the old St. Vincent's Hospital. Fake-smake. The only thing real about Singer is his incompetence. GET OUT NOW! Singer purchased the building in bad faith and never intended to honor the deed restriction. He was offered an excellent deal by Bloomberg but it wasn't every single thing he wanted so he turned it down. That case could be made in court by the city (or anyone paying lawyers) but it would help if the groups advocating for turning it back into a community center had a plan for what exactly they would do with the building (including financing). Unfortunately after many, many years, they don't. And Singer getting caught (by the Daily News!) and shouting "fake news!"?!?! Now that's funny. What's fake is the supposed management he is providing for 30K a month. HAHA! That's hilarious that you think DiBlasio is going to do anything about this. He's so dumb, he doesn't realize quoting the most hated POTUS -- who everyone knows only calls true things fake news -- is only going to make things worse? Not shocking at all. Is the City contemplating a demolition by neglect lawsuit? The Landmark's Preservation Committee can FORCE Singer to maintain and repair the building. It's been done in other cases. Greg Singer just proclaimed he's a Trump supporter by using "fake news."